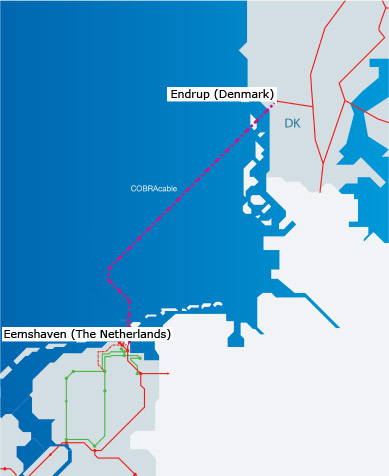 A subsea power line set to link the networks of Denmark and the Netherlands reached the Dutch coast on Friday as part of plans to share excess electricity from wind farms and other sources. "This is an important step towards the integration of electricity networks in western Europe," said Jeroen Brouwers, spokesman for Dutch grid operator TenneT. Rapid growth in renewable energy generation including wind and solar has increased the need for better interconnections between countries, prompting grid operators across Europe to invest in new cross-border lines. Wind turbines already supply around half of the total electricity needed in Denmark, but last year delivered only around 2 percent of all energy in The Netherlands.